Are you bitten by the ombre lip bug? I wasn’t. For some reason, it’s one of the makeup trends that passed me by. I did notice however, that there are two sorts of ombre lips – the Western ombre lip trend, and the Korean ombre lip trend. The Western ombre lip trend has a deeper colour on the outer lip, and a lighter shade on the inner lip. This, I find, makes lips look larger and more pouty. The Korean ombre lip trend is reversed, with a deeper colour on the inner lip and a very light shade on the outer lip. I think it’s supposed to give off an innocent vibe, like that of someone who’s just sucked on a cherry lollipop. Neither is really my style LOL! But I know the Korean lip style is quite popular. There are any number of makeup tutorials out there teaching you how to create this look. But if you’re anything like me (read: not great at following instructions 😛 ) then Laneige has made the job a million times easier! 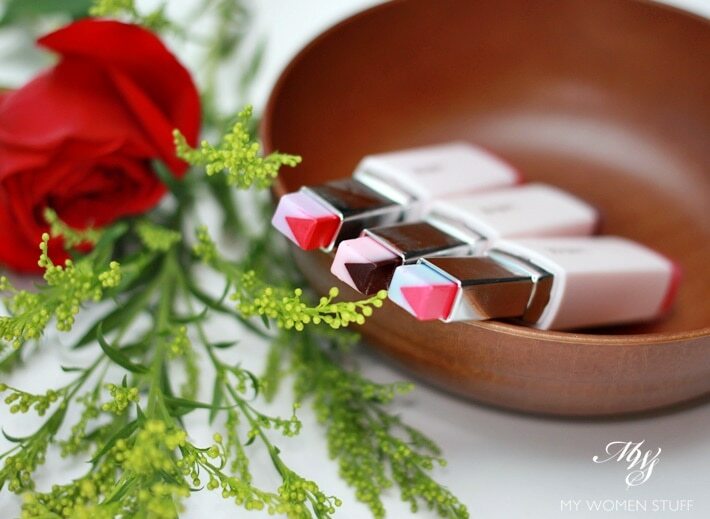 As the name implies, the Laneige Two Tone Tint Lip Bar is supposed to offer more of a tint of colour. However, I found that the colour (in the V-shaped portion) is pretty intense. The outer layer, despite the pretty pastel colours, is a transparent balm. The different shades therefore are formed by the actual colour in the V-shaped portion of the lipstick. I was warned that the original version was rather drying on lips, so I was a little apprehensive. However, I’m going to tell you that these are really nice and moisturising on lips. I attribute it to the balm portion, which is quite soft and emollient, and leaves my lips feeling comfortable and moisturised. What this feels like therefore, is like a balmy, moisturising lipstick. Very comfortable, so thumbs up in that area! The other thing I wasn’t sure about was the shades. I haven’t personally had many good experiences with Korean makeup because their lip colours can be a little off for me. These however, were a pretty decent colour – nothing too strange or too warm. 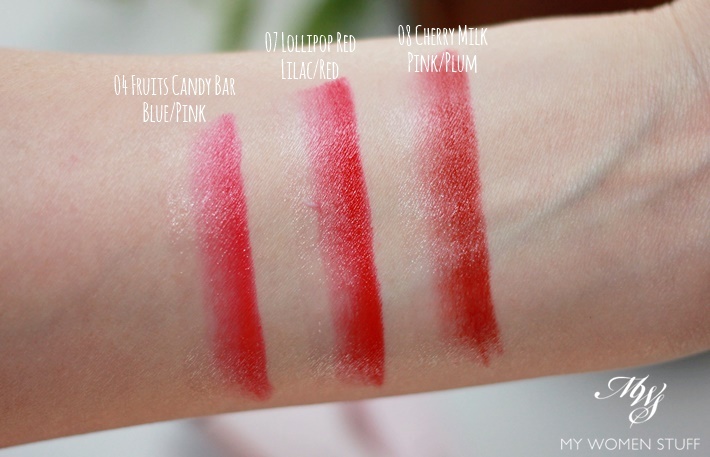 The Two Tone Tint Lip Bar swatches are below, swatched straight from the tube. You can see how on left, is the balm, which swatches clear. On right is the colour as contained in the V-shaped part of the lip colour. The middle, where the V cuts into the balm, is where the colours intersect and blend out and makes the ombre. 04 Fruits Candy Bar Blue/Pink – It’s a fuchsia pink housed within a pale blue balm, and it actually swatches quite strongly, but surprisingly more red than pink. 07 Lollipop Red Lilac/Red – This one’s a red within a lilac tinted balm and similarly, swatches quite a strong red. The balm portion tempers the colour somewhat, so someone who is afraid of wearing red lipstick might find this more wearable. Personally though, I prefer wearing it all over. 08 Cherry Milk Pink/Plum – This is actually my favourite of the 3 shades. In tube, it’s a very very deep plum which looks quite scary and gothic. But when swatched, I loved the deep cherry red! Here’s how the 3 shades look when I wear it. I wore 04 and 07 as an ombre lip. For the bottom lip, I angled the V-shaped portion to apply to the inner lip, while the balm applies onto the outer portion of your lip. For the top lip, you have to turn it the other way around, so the V-shape applies on the inner lip. It’s a little awkward when applying on the top lip, due to the angle of the lipstick. Personally speaking, I wasn’t too thrilled about how the ombre lip looks on me. I feel it makes my lips look smaller than normal, and a little disproportionate to my face. As the colour is quite strong, it isn’t necessarily a “tint” of colour at all, but a full on opaque lip colour. 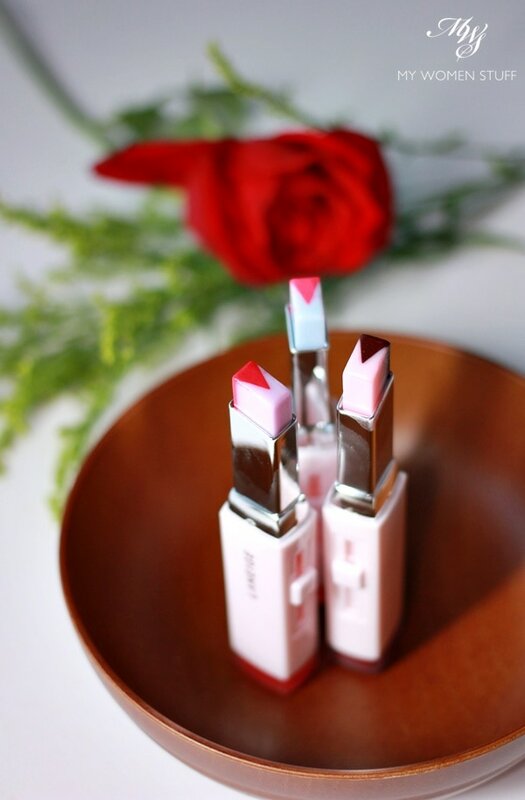 The Laneige Two Tone Tint Lip Bar is a liptick with a lip colour on one side and a clear balm on the other. The way it is made allows you to swipe it on to immediately create a Korean ombre lip style. Personally, I like to just wear the colour all over my lip. The colours are attractive, opaque, and the texture is comfortable and moisturising. There is a sweet candy scent that may or may not appeal to you. It doesn’t usually sit well with me, but I quite enjoyed this one. The plastic packaging does make it feel like a toy, but I forgive it because the colour and texture is impressive and in this day and age, it’s pretty affordable. Do you like the ombre lip trend? 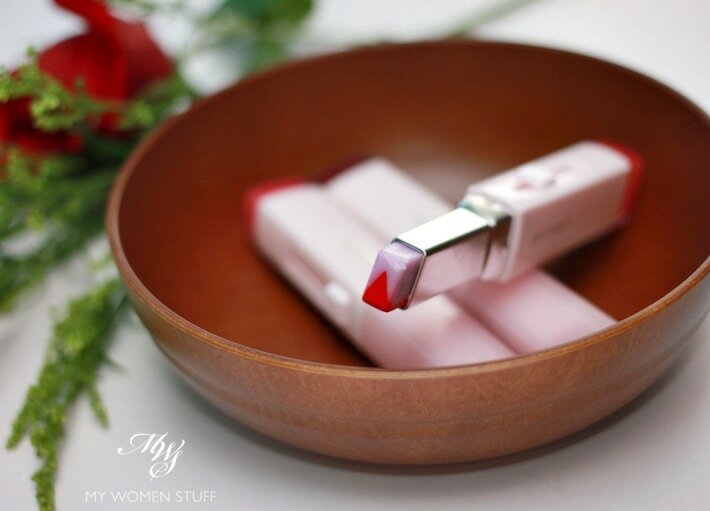 Have you tried this two tone style lipstick from Laneige? Having tried it, I’m not sold on the ombre lip look on me. I much prefer a full on lip, and better yet, in a bold colour. I think it suits me better, but hey how about you? Have you tried the ombre lip trend? Disclosure: Featured products were press gifts for consideration. Our commitment is to honesty and fairness. For review guidelines please read the disclaimer. NEXT POST: I’ve finally worked out how to wear bronzer and it shows you can teach an old dog new tricks! The idea of you doing “an innocent vibe, like that of someone who’s just sucked on a cherry lollipop” had me in fits and giggles. I am not sold on the whole ombre thing either – personally, I think it looks really odd. I’m so not a coquette 😛 And I think the ombre lip thing can work up to a certain age. After that, it’s called trying too hard LOL! I honestly thought the ombre lip color looked like a mismatched lip liner plus lip color. 08 looks good on you though. In some looks, it can certainly look that way! To me however, it looks like unfinished lipstick, like you didn’t apply it properly. Just not a look I favour I guess hehe… Thanks, I’m leaning to 08 too! I prefer full red lips anytime! ? ?Makes me feels like “I’m serious & I don’t have time for any of you nonsense”. ???? My favorite is Clinique Mightiest Maraschino Chubby Stick. ? And I totally agree after a certain age – this won’t work – BUT I am lemming for the Benefit version – juz let me pay off my car insurance and road tax first – not to mention the horrible petrol price this month ? The ombre trend really isn’t for me. 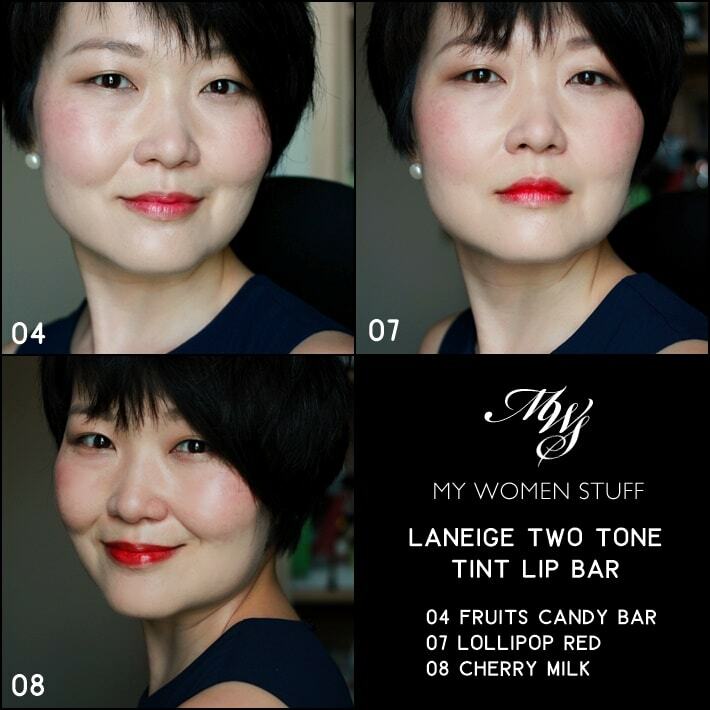 I tried another two tone lip product from another brand (because I really didn’t want to spend $35 CAD on Laneige) and it just did not look good. Like you, I prefer the solid one shade vs ombre. A friend of my who did tried this absolutely loves it and is trying to convince me to buy these. But honestly, I’m ok. I’ll stick to my other lipsticks. I wish the Laneige serum lipsticks were released in Canada. I hear those ones are quite good. Thought of getting this from Laneige but backed off cos I heard the original ones are rather drying and I already have dry lips. Similarly I love full reds; it’s the easiest way to perk up a tired face! But the Laneige tint bars does look so pretty! =) I have one of them, they are pretty price IMO, but still love them and wish I can have the whole set (oh greedy me but my wallet will scream). Love your posts and can't wait to see more! Oooh, these looks amazing! I’ve been applying my lipstick to manually achieve the gradient lip, and this looks a lot easier than the smudging I do. xD Definitely going to have to pop in stores to check out 04 and 07. Haha lollies! They smell like them too 😀 I’m actually not certain where you can get them, because we have a few sites locally that sell them but I checked and they don’t ship outside of the region. I saw some on ebay, amazon and gmarket and also at this website shopatkorea but I haven’t used their service so I don’t know how reliable or authentic they are, sorry! But they do have it! I actually think you look quite hawt in 07!! Plus your fair skin, you definitely look like a Korean superstar! I’ve been applying my red liquid lipstick to manually achieve the ombre lip effect because 1) full-on red scares me still, 2) the lipstick I own wears off easily, so I won’t look like I have melting lipstick if I were to do the ombre look (as opposed to full lipstick).